Focus™ is an antibacterial polymer for internal infections of fish. It may be used alone or mixed with other medications to make them palatable to fish and greatly reduce the loss of medication to the water through diffusion. 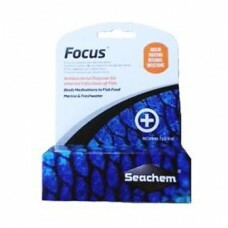 Focus is for the use in freshwater or marine aquariums. Use in combination with medication of your choice in a 5:1 (Focus™: medication) ratio by volume. Blend with fresh or frozen food. Feed food as usual, but no more than fish will consume. Use at every feeding for at least five days or until symptoms disappear. Active ingredient: polymer bound nitrofurantoin (0.1%). This product is not a feed and should not be fed directly. Its intended application is to assist in binding medications to fish food.